With Batman V Superman: Dawn of Justice out of the way, Marvel has the rest of 2016 on lock. This May, the delicate alliances formed in the Marvel Cinematic Universe will be torn asunder in Captain America: Civil War; and then in November, Doctor Strange will explore the universe’s more mystical side while introducing Benedict Cumberbatch’s take on the Sorcerer Supreme. That doesn’t mean Derrickson and his team are out of the woods yet – there’s a lengthy post-production period planned for the MCU entry, which will feature no shortage of CGI. That said, even with the film itself a while off, these new set photos provide our most in-depth look at the look of the pic to date. 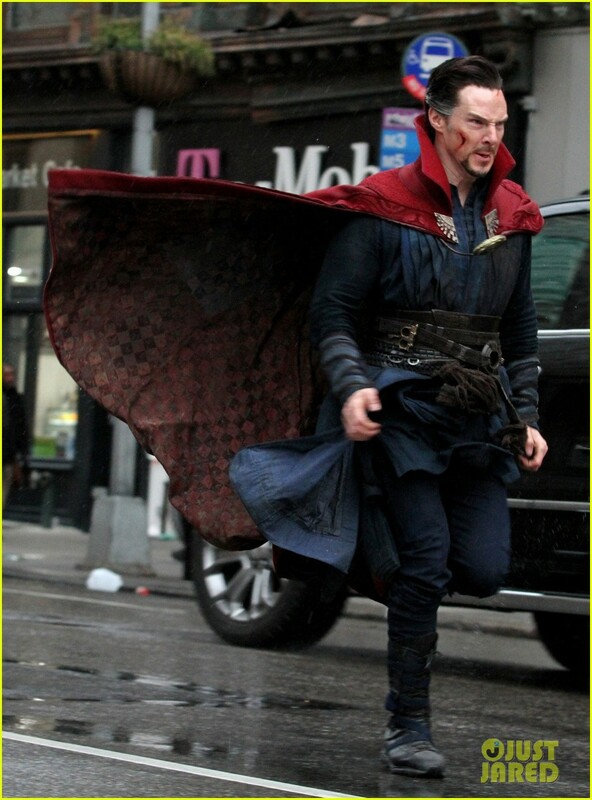 Cumberbatch is in full costume, as is Chiwetel Ejiofor, taking on the role of Strange’s one-time ally (and later enemy) Baron Mordo. The pair are seen in the thick of a crucial battle unfolding on the streets of downtown New York – and involving a mysterious baddie played by Hannibal‘s Mads Mikkelsen. The character’s identity has been kept under wraps so far, but he’s the main antagonist that Cumberbatch’s Strange will have to contend with. Tilda Swinton co-stars as The Ancient One, with Michael Stuhlbarg playing Nicodemus West. Others on board in undisclosed roles include Rachel McAdams, Benedict Wong, Amy Landecker and Scott Adkins. Doctor Strange arrives November 4.